The kid has ginger hair and freckles, and looks about five years old. Tense with anticipation, he is staring at the railway track. A locomotive shrieks and emerges out of a tunnel and, drawing several carriages behind it, disappears around a bend. He flashes me a gap-toothed grin. "Wow!" he breathes. "Cool!" I am at Vancouver's Granville Island Model Trains Museum and, like the youngster, now excitedly peering at another section of the model railway, I am "wowed" too. Laid out before me-floor to ceiling-is an 80-foot long diorama, with five tracks covering four levels. The teeny trains, including replicas of the Royal Hudson, C.N. and C.P. railcars, traverse a landscape resembling B.C. 's Kettle Valley. 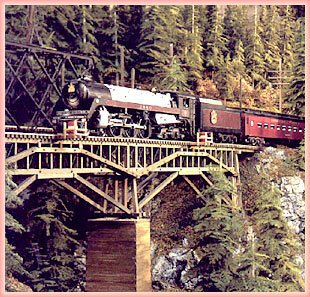 They trundle, chug and hoot past lakes, along mountain ledges, through tunnels, over amazingly life-like trestle bridges, and weave through forests of cedar, hemlock and fir trees-6,000 of them to be exact. Each branch of every tree has been individually glued into place. Mounted on wooden struts overlaid by Styrofoam and bound together by fast-drying orthopaedic bandages, the entire display took a Warren Jones-a gifted diorama artist-and a team of dedicated architects and craftsmen, over a year to complete. And that's not all. 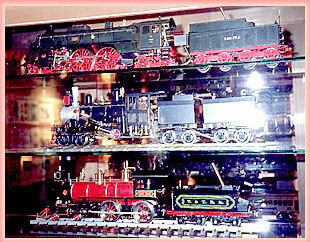 Beech-wood cabinets line the walls and on their glass shelves stand thousands of miniature trains. It is, in fact, the largest collection of toy trains on earth! They range from gleaming brass miniature locomotives and wind-up trains from the turn of the last century, to a pink train set, circa 1958, designed for girls by Joshua Lionel Cowen - a rare and valuable addition to the Museum collection. 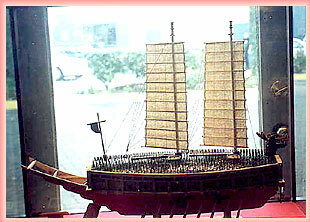 The Model Ships Museum has its own set of unique wonders. The display of war ships spans several centuries, from Admiral Nelson's HMS "Victory" to a modern Russian titanium nuclear submarine. Keith-King points out an example of engineering ingenuity: a US submarine which can submerge and re-surface. It also fires underwater torpedoes, has a periscope which moves up and down, rear guns that swivel and shoot blanks, and a variety of sound effects: a sonar ping, the rumble of deisel engines and a dive klaxon. The model has been featured in two episodes of the X-files, where it appears on film as a full-size sub. At centre stage in the Ships Museum is a 13-foot long 700 pound, meticulously detailed model of the HMS Hood, which took model ship-builder Rodney Henriksen, 20 years to complete. As Keith-King and I turn to leave, a white-haired gentleman clears his throat. He wears the same expression of bemusement as the small boy in the Model Trains Museum. "See this model of the HMS Lion?" he says to us. "Well, during World War I, my Dad was personnel officer in the Royal Navy when she limped into Edinburgh after the Battle of Jutland. My father was responsible for mustering the marines who served on the Lion after she was re-fitted and sent back into action." He smiles reminiscently. "As for the HMS Hood…I was a young chap at the time, but I saw her in Portsmouth Harbour before she was eventually sunk by the Bismark in 1941…"
Keith-King's eyes light up. This is what his Museums are all about. Rekindling memories, evoking true-to-life tales, keeping the flame of history alive-and delighting all those who walk in, whether they are five or seventy-five years old. IF YOU GO: The unpretentious entrance to the Granville Island Museums is located at 1502 Duranleau Street, Granville Island, Vancouver. It is open daily from 10 a.m. to 5.30 p.m. Phone (604) 683-1939; Fax (604) 683-7533. 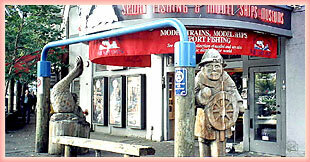 Visit their comprehensive web-site at www.granvilleislandmuseums.com for further information.